The 2010 MAAC season begins this Saturday with Canisius at Niagara and St. Peter's at Rider. I will be at Niagara University for that doubleheader. I think this season is shaping up to be very competitive, first with the battle to gain a spot in the top four to qualify for the tournament, then for the Championship itself. Canisius, Fairfield, Niagara, Manhattan, and Iona seem to me to have the upper hand, but there could be surprises. From this point on the play should be intense. Manhattan defeated Columbia in the first game of a doubleheader Sunday with the help of some home run hitting. Jaci Rahey (pictured) was 3 for 4 with a grand slam homer in the third inning which brought the Lady Jaspers back from a 3-0 deficit. Nicole Michel was also 3 for 4 for Manhattan, hitting a three run homer in the fifth inning to seal the victory, and even Manhattan's record at 7-7. The two teams will meet for another game shortly. The second game of the doubleheader was canceled. The Purple Eagles beat Lehigh Sunday in the first game of a doubleheader 6-3, scoring all of their runs in the first inning. A three run homer by Teresa Healy, and a three RBI double by Alexis Wayne allowed Julie Dimatteo a comfortable lead which she held, allowing four hits and striking out seven. The teams will play once more to close out a four game set. Niagara lost the second game 11-6. 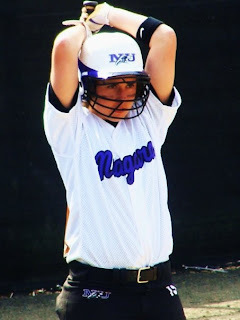 Niagara's freshman Becky Zill did hit a grand slam homer. When Troy High School softball star Shannon Jones declined numerous offers from around the country to sign with the local college last year Siena rejoiced, and with good reason. Guess which freshman currently leads the MAAC in hitting ? Shannon is up to .436 at the moment, hitting 7 for 10 so far this weekend at the Coastal Carolina Tournament. The Saints are still in the rebuilding stage, but they are assembling plenty of young talent, with more to come next season, so the future looks bright. BTW, the Saints scored 3 runs in the bottom of the 7th Saturday to beat Coastal Caroline 3-2. The Iona Gaels split a pair of games today at local rival Columbia, winning the first 9-1; and falling short in the second 5-4. Allyssa James led the way for the Gaels in the opener, hitting 4 for 4 and scoring three runs. Freshman Eileen McCann contributed by hitting her MAAC leading 8th homer of the season; pitcher Sarah Jackson gained the win by throwing a complete game 2 hitter. The Gaels are back in action Tuesday playing a doubleheader at Lafayette. The Lehigh Mountain Hawks are defending Patriot League Champions and currently have a 9-7 record. First pitch both days will be at 12pm EDT. 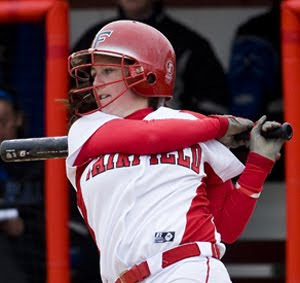 The Fairfield Stags swept their doubleheader today against Central Connecticut State, winning 20-9 and 6-4. Senior Dani Griswold (pictured) hit 5 for 6 in the first game, including three doubles and five RBIs. Senior Kristie Trifiolis was 4 for 5 with four RBIs, two doubles and a home run. The Stags as a team produced 21 hits. Actually, Fairfield was losing this game 8-6 when they exploded for 14 runs in the last two innings. In the second game, junior Kristina Lingo went 3 for 4 with four RBIs, including a home run, as the Stags scored six in the first two innings and held on for the win. The sweep today raises Fairfield to a first place tie in the MAAC with Canisius. 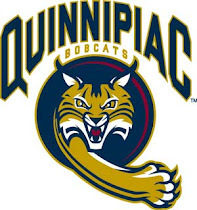 The Stags host Quinnipiac Thursday for a single game. 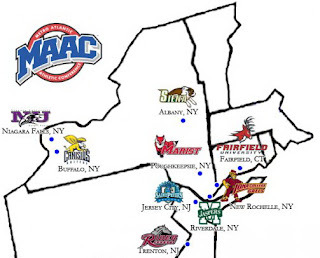 MAAC schools finally get some home games in beginning today as St. Peter's will host Fordham, and Marist will entertain Yale. Rider will be at home Thursday against St. Joseph's; the same day Manhattan will host Army in a doubleheader that was recently added to their schedule. 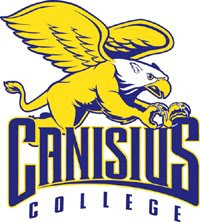 Canisius is scheduled to play on campus against Buffalo Friday, weather permitting. Iona Shuts Out Sacramento St.
Sarah Jackson threw a complete game shutout and Eileen McCann continued her hot play as the Iona Gaels defeated host Sacramento State Saturday at the Capital Classic 5-0. Freshman Eileen McCann (pictured) hit a 3 run homer in the first inning to give the Gaels all the runs they would need. The homer was Eileen's 7th of the season; she is currently hitting for a .405 average. 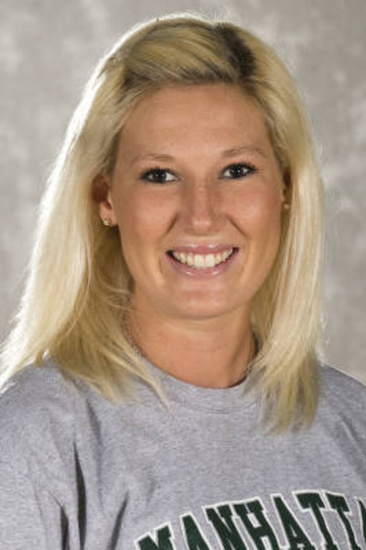 Sarah Jackson allowed only 5 hits and evened her record at 3-3. The Gaels close their California trip Sunday with a game against Nevada. Niagara closed their play today at the UMBC Spring Classic by going deep seven times...but it was only good for a split. The Purple Eagles opened the day by coming from behind to beat Lehigh 7-3. Niagara got homers from Kristin Sito, Teresa Healy, Maggie McDonald, Jaclyn Russell, and Alexis Wayne. They can pour it on in a hurry, and got a couple more from Teresa Healy and Gabrielle Lustrinelli against Mount Saint Mary's. Unfortunately, Niagara gave up four homers themselves in that game and lost 15-7. Niagara scored their seven runs on only six hits, but just didn't get the pitching. Niagara is now 5-7 and travels to Lehigh next weekend before opening MAAC play. The Iona Gaels opened play at the Sacramento State Tournament by defeating Utah State 5-0 today behind the 4 hit pitching performance of Deanne Algeo. Offensively the Gaels benefited from a 2 run homer by Eileen McCann in the first inning. This victory is impressive due to the fact that earlier in the season Utah State defeated #1 Washington. The Gaels continue play Saturday with two games in Sacramento. Niagara is now 4-5 and will face off against host UMBC later today. The Iona Gaels used two pitchers to no hit UC Davis Monday in the second game of a doubleheader between the two teams. Alyssa Maiese started and Sarah Jackson finished the no hit game won by Iona 3-2. Davis did score two runs on four walks, two wild pitches, a passed ball, two hit batters and two errors in the first four innings. Sarah Jackson pitched three perfect innings of relief to seal the victory. 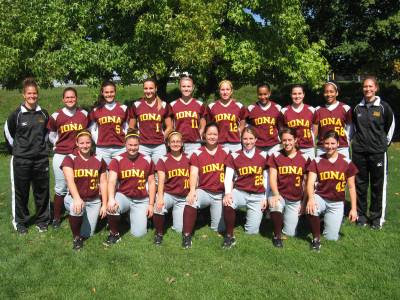 Iona lost the first game of the doubleheader 9-5, and are now 4-5 on the season. They continue their California road trip at Pacific Tuesday, then at St. Mary's Wednesday. 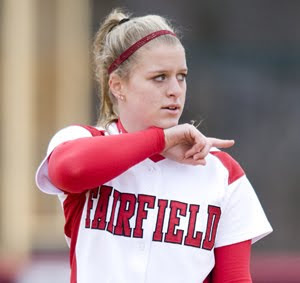 Fairfield's Sarah Minice, 2009 MAAC Pitcher Of The Year, picked up a victory over South Florida today at the Under Armor Showcase in Clearwater, FL. The Stags beat the host team 3-2, as Sarah held South Florida to 6 hits while striking out 7. Earlier in the day, Fairfield beat Toledo 4-3 and now have a record of 7-7. Because of rain in Tampa Friday, the Fairfield Stags have had their schedule adjusted. Saturday they will now play Toledo and host South Florida. 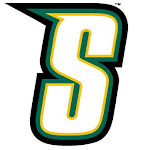 Sunday they will play Southern Illinois. Marist will be providing audio coverage of the Red Foxes at the Rebel Spring Games in Kissimmee, FL beginning this Sunday. 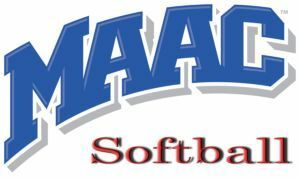 The last two MAAC teams yet to play games, St. Peter's and Manhattan, open their seasons this weekend down in Florida at the Rebel Spring Games. Schedules are listed on the left hand side of this site. Niagara freshman Becky Zill had her second 4 for 4 performance in as many days at the Spartan Classic in Norolk, VA Sunday, but it wasn't enough to prevent the Purple Eagles from losing to Lafayette 5-4. It may have been enough to win her MAAC Rookie Of The Week though! Freshman Becky Zill's 4 for 4 performance helped Niagara dig out of an 8-1 hole to beat Colgate 14-11 in the first of their two games at the Spartan Clash in Norfolk, VA Saturday. 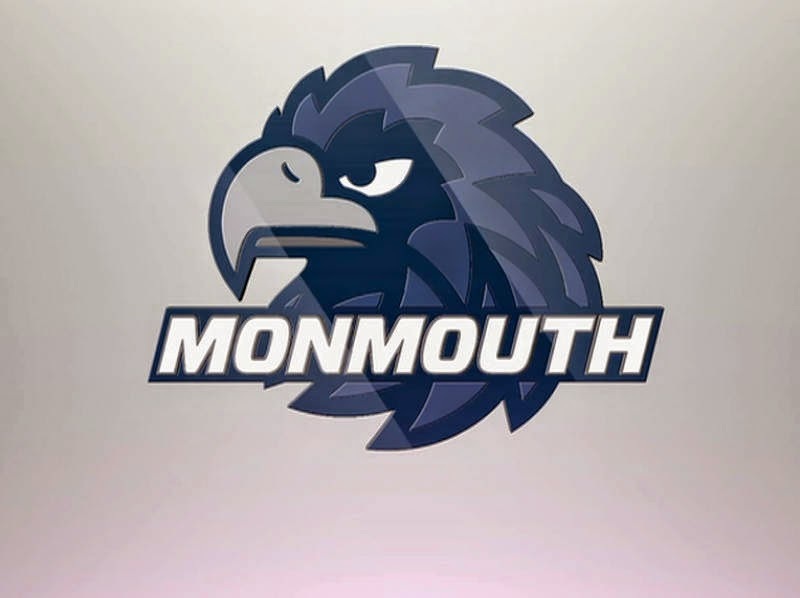 The Purple Eagles scored 4 times in the second inning, then 7 times in the third inning, then twice more in the fourth to take control of the game in typical Niagara fashion. Kristin Sito hit a homer in the game, Teresa Healy knocked in 2 runs, and newcomer sophomore Jaclyn Russell knocked in 2 herself. Julie DiMatteo pitched 5 innings to pick up the victory. In their second game of the day, Niagara found themselves down 2 runs in the fourth inning against Lafayette when they once again rallied beginning with a Kristin Kill RBI single. Kristin Sito completed the comeback with a 2 RBI double to win the game 6-4. Cassie Stone went the distance to improve her record to 2-1. Niagara now stands at 3-4 and returns to action Sunday against the same Lafayette team. BTW, Amanda and Jodi were teammates last year at King High in Riverside, CA. Tess of Cleveland St. is being called the best freshman the Vikings ever landed. A look at her stats is proving this to be correct: In 10 games she has 6 homers. So how did they do when they faced off? In the first game, Tess hit a homer, Kristin had 2 hits, including a double. Cleveland St. won in 8 innings. In the second game, Kristin hit a 3 run homer, Tess had 2 hits, including a double. Cleveland St. won 7-6. The scores were close, let's call it a tie. But they'll have another chance to break the tie when Cleveland St. visits Niagara on May 5, a game I will definitely attend! The Golden Griffins went 3-2 at this past weekend's Kickin' Chicken Classic hosted by Coastal Carolina in Conway, SC. 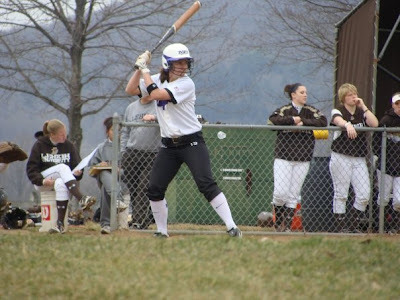 Canisius exploded for nine home runs over the weekend, two by Lizzy Gatto; two by Kerry Ulmer; two by Paige Freiberger; two by Michelle Fridey; and one by Katie Lancellotti. The Griffs won over Eastern Kentucky (14-6); Jacksonville (5-0); and Coastal Carolina (10-1). They lost a pair to DePaul, 8-0 and 6-2. Canisius is currently on top of the MAAC with a 7-7 record, and will play this weekend at the George Washington Invitational before taking a week off for spring break. The material on this site is distributed without profit to those who have expressed a prior interest in receiving the included information for research and educational purposes. This site may contain copyrighted material the use of which has not always been specifically authorized by the copyright owner. We believe the use of such material constitutes a 'fair use' as provided for in section 107 of the US Copyright Law.